It’s so easy to turn economic indicators into a boring series of definitions and calculations (think Ben Stein in Ferris Bueller’s Day Off). 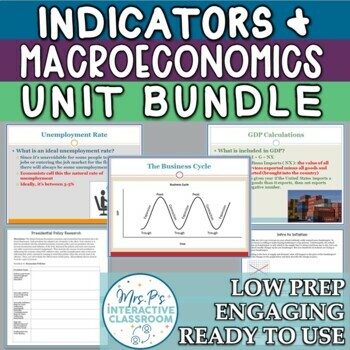 Yet this unit is one of the most relevant to students’ lives outside high school since they’re bound to be affected by economic performance throughout their lifetimes! So, my approach is all about taking the concepts and getting students excited through their own research! Sure, they’ll learn most of the concepts through (engaging, interactive, student-driven) lectures, but they’ll enhance their understanding through discovering how these concepts impact the US, their state, and the world through simple research. I love walking around hearing my students say things like “What the heck happened to the US in 2008? !” while researching indicators. If you’re like me and you want your students to truly connect with and become engaged in your material, this unit is for you! 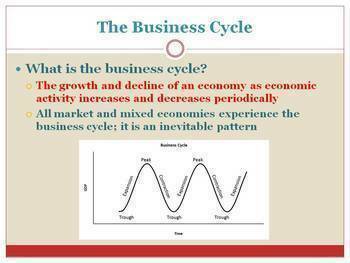 There are 2-3 days of full lesson plans for GDP, 2 days of lessons for unemployment, a 1-day lesson for inflation, a 1-day lesson for the business cycle, a 2-day lesson on free trade & the global economy, and 1-2 days of lesson plans for monetary & fiscal policy. At the end is a culminating exam that combines vocab with critical thinking questions. 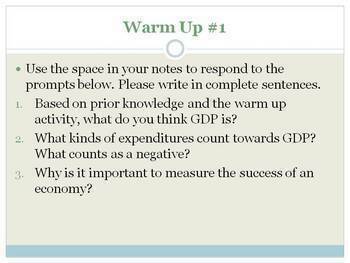 For most lessons, along with lecture notes, I've included engaging activities and critical thinking opportunities throughout the lessons as well as plenty of practice and research opportunities for students as they familiarize themselves with these fundamental Economic concepts. My philosophy is that activities should always be fun, educational, and very low prep. Therefore, there is not a lot of prep work involved in any of the lessons. Please view individual lessons prior to purchasing. The timeline assumes 50-minute periods, but they can be combined for a block period schedule as well. For freebies, teaching tips, and more, sign up for my monthly newsletter and check out my blog! When you sign up, your first email will come with FREE supply and demand warm ups!